Will Another Tumultuous 48 Hours for China’s Economy Threaten the Country’s Senior Leadership? China’s newfound faith in the free market didn’t last very long. On Tuesday the People’s Republic indicated that it would allow markets to play a greater role in determining the country’s exchange rate. By Wednesday the country had apparently completely reversed itself, raising questions about Beijing’s stewardship of the economy at a time of deep uncertainty. China has historically maintained strict controls over exchange rates—officials set the rate each morning, and it can only go up or down by 2 percent each day. But under Tuesday’s newly announced policy, China’s central bank said that it would base the rate more closely on trades in international markets. It seemed like a win-win: Chinese manufacturers would benefit from a cheaper yuan at a time when the country’s exports are flagging, and the foreign governments and international institutions that have long accused China of currency manipulation would be placated. The move would also further Beijing’s goal of establishing the remnimbi as a global reserve currency, and it was welcomed by the IMF. The U.S. government’s reaction was more tentative—after all, the long-standing U.S. complaint about China’s currency manipulation was that the yuan was too low, which artificially boosted its trade surplus and harmed American manufacturing. On Wednesday morning, though, the new “market-based” yuan was down an additional 1.6 percent, setting off concerns about the overall health of the Chinese economy in world markets. 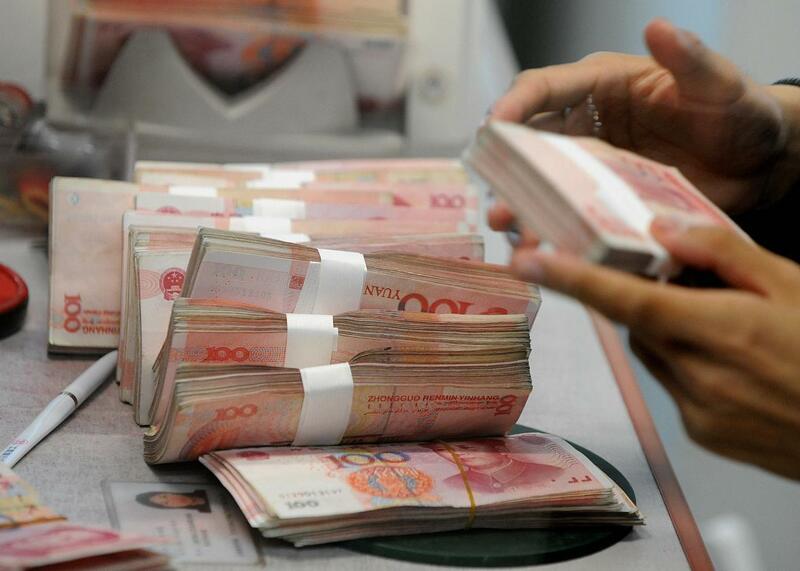 In offshore markets where the Chinese currency is traded freely, the yuan fell throughout the day. In onshore trades it was getting close the low end of the 2 percent threshold. Then, with about 15 minutes left in the Chinese trading day, the central bank evidently decided that enough was enough. So the country’s economic leadership instructed state-owned banks to sell dollars, reversing the day’s trend and pushing the yuan back up about 1 percent. It certainly looks like markets weren’t buying the central bank’s reassurances that exchange rates would remain “basically stable,” which seems to have forced authorities to intervene to prop it up in direct contradiction to the previous day’s stated intentions. The wild couple of days in the currency market compounded the damage already done by July’s stock market crash to the Communist Party and President Xi Jinping’s reputation as competent stewards of the country’s economy. Xi has amassed unprecedented political control and eliminated potential rivals through a massive crackdown on both corruption and political dissent. That might be all fine by Chinese citizens as long as the government continues to provide strong economic growth, but it works less well when the government seems incompetent on economic matters. The “Chinese dream” Xi has promised citizens includes not just national greatness but personal well-being. In the boom months leading up to the stock market collapse, the state-controlled media had strongly encouraged middle-class Chinese citizens to invest in the market, with one magazine promising a “thirty year golden age.” Ultimately, the fortunes of about 80 million investors evaporated in a matter of days, before the government took drastic steps to stop the carnage. An even bigger threat to the country’s growth than the market collapse are falling exports, caused by a combination of lower foreign demand, increased competition from lower-wage labor elsewhere in Asia, and the previous strength of the yuan. Overseas shipments were down 8.3 percent compared with last year in figures released last weekend, a wake-up call that almost certainly led to this week’s currency moves. But as Slate’s Ali Griswold points out, while exporters would benefit from a lower yuan, it if were to fall too much, that would be bad news for Chinese companies that have to pay interest on their debts in foreign currencies. This could also be bad news for the small and medium-size companies, crucial to China’s continued growth, who already took a hit this summer from the market crash. China’s policymakers have looked much more panicky and uncertain this summer than they normally do. If businesses start failing at a higher rate, it could prompt some public dissent, but, as journalist Adam Minter recently noted, the party has become pretty adept at managing public protests over pocketbook issues. The backlash could be more meaningful within the senior levels of the party itself. Prime Minister Li Keqiang, who’s been more actively involved than Xi on economic issues, might end up being forced to take the hit for his boss. But given the number of enemies Xi has made through his anti-corruption purge, there’s certainly no lack of powerful people looking for any sign of weakness from the man at the top.